When people learn I’m a plastic surgeon, I get a lot of questions about how to look better, what products are available today and how it effectively they work. So I got the idea to do a series of free seminars that answer those questions and more. 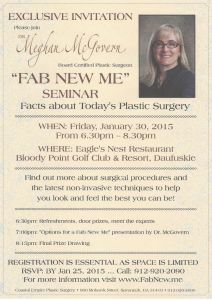 On January, 30 I will present a Fab New Me Seminar at Bloody Point Resort on Daufuskie Island. Interested? Check out the invitation, then RSVP quickly to make sure you reserve a spot! Or find my Fab New Me page on Facebook and RSVP to this event by clicking here.